21-year-old Sydneysider Tom Purcell aka Wave Racer is another young gun who seemingly exploded onto the Aussie electronic scene out of nowhere. In no time at all, he’s already set to take the world by storm. We chatted with him about his history, influences, and the Wave Racer journey so far. Right now I’m in a hotel room [in Melbourne], about to leave to go to the airport to fly to Adelaide for a show tonight. Well I’ve been making music my whole life, I played guitar in high school. As far as electronic, I finished high school and was making music for my friend Sebastian when we discovered some old disco samples. I was making house tracks out of old ‘70s and ‘80s samples, and we did that for a year or two. Wave Racer project only really started in May or June last year. Well you’ve come so far in that time. Were you in a rock band before? Oh, it was just in high school. I think everyone in high school is a bit of a rock kid. I learned acoustic and electric guitar for like seven years in high school. I was in a blues band and a rock band, I did HSC guitar. I was pretty obsessed with it, I don’t play anymore really. Yeah, definitely. I still have it, I haven’t gotten rid of it yet, so if I ever want to, I still can. So what did you grow up listening to? I grew up listening to a lot of band music. I didn’t really listen to electronic til I was about 17. I listened to a lot of funk, I was obsessed with Red Hot Chili Peppers, Muse, Rage Against The Machine, stuff like that. It was weird. In terms of electronic, who would you consider your biggest influences? Oh, that’s a good question. Hmm, influences. I’d probably say most of my influence comes from music t that I find on the Internet. Whether it’s well known or unknown, it’s stuff I usually find scrolling through Soundcloud. And this is a really boring answer, but Daft Punk and stuff like that. I was really into Ed Banger Records when I started making electronic. Before I was Wave Racer I was obsessed with Justice and that whole Paris crew , like crazy electronic punky stuff, it was the crossover between funk and electronic dance music, and that’s what really gave me my love of electronic. And are there any artists out there that you’re envious of – do you ever get that feeling, ‘I wish I wrote that track? That’s a tough one, there’s a lot of stuff like that, I constantly listen to stuff that I wish I’d made. A specific example? I’m gonna say James Blake. Pretty much everything James Blake does, I’m blown away by. Every time I listen to him, I’m like, how the hell did he come up with that? 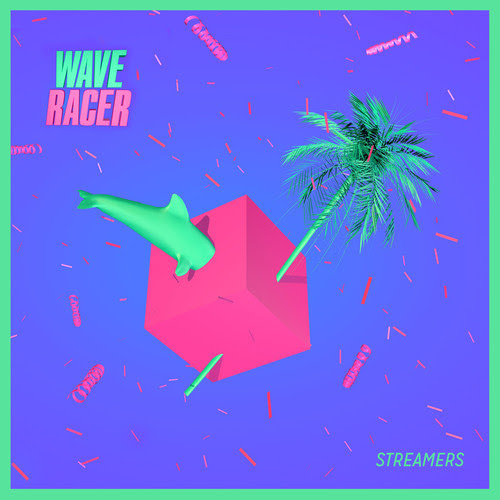 Wave Racer hasn’t been around for long but you’ve already hit it pretty big – signed to Future Classic, loads of festivals, and now your own tour. How does that all feel? Pretty crazy, I obviously never expected anything to happen. I haven’t been around too long but I think I knew a bit about how it all worked because I’d been making music before Wave Racer. I’ve been friends with a lot of people in this business for a long time before Wave Racer. I think a lot of it comes down to luck as well. I knew my management team before I was Wave Racer, and when I became Wave Racer the offer was there for me, I already understood what they’re about. Obviously I never expected so much to happen, but I think there’s a lot of reason as to why it happened that way. Where’s your favourite place you’ve played so far? One festival I played at which was extremely memorable for me was OutsideIn. It was one of my very first gigs and that was run by Future Classic. It was amazing, probably one of the coolest festivals I’ve ever been to. I was lucky enough to play there and to get all my friends there to see me, because that was my home town. It was a huge crowd, it was really awesome, everything went perfectly, it was beautiful. The other one that was beautiful and crazy and kinda scary was Lorne Falls Festival, actually just all the Falls Festivals, particularly Lorne and Byron Bay. I played to the biggest crowds of my life. At first I was really scared but the crowd were loving it. These massive crowds were responding to my original songs and remixes, and they recognised it. Did you get to catch any other sets at Falls? Yeah a little, I got to see The Roots, Solange, Flight Facilities and Neil Finn. I saw a bit of Pond, Rufus who played before me. Did you get to hang out with anybody you’d wanted to meet? I got to hang out with pretty much everyone on the Falls and Southbound tours. A lot of people I already knew, but it was really fun, everyone was super nice and friendly. To be honest, it was pretty tame. Southbound was a party, everyone was getting into it. I’ve definitely had crazy times outside of that festival. Probably the triple j house party, everyone was mental, it was partying every single night. Everyone was there for the party, it was super fun. If you could pay a set anywhere in the world, where would it be and at what time of the day? Hmmm. I really like daytime sets, so I’ll go with a daytime set somewhere outdoors. Maybe on an island in a tropical part of the world, like the Bahamas. An island party would be super cool. To be honest I’m not sure if I could choose, I’ve never worked with anyone collaboratively. I don’t know how I’d work in that sense. I’ve had a lot of offers, but I haven’t had the chance. I usually do everything very obsessively by myself so I don’t know how that’d translate to a collaboration. Do you think you’ll want to do collaborations in the future? Yeah, I think I need to change a bit, I’m so used to the way I’m doing it, I haven’t really learnt other ways to work. But I definitely need to be more open to that, learning to work quickly and while I’m on the road. It’s gonna be hard to learn but I’ll get there. I always listen to a bit of everything. Often stuff that’s very obscure and unknown, there’s a whole internet and music culture which is almost separate to real life music culture. I am very immersed in the internet music culture, I play a lot of it in my sets as well. I’m listening to so much, some Australian music, a lot of Hayden James, I think he’s an amazing producer. Even things like Flight Facilities – I love their song writing ability. As far as Australian music goes, I listen to it all, I let myself understand how the Australian music scene is going. Other than that, stuff from all around the world, mainly Soundcloud stuff. Well I’m in the middle of my own tour and the shows have been going really well so far. Then I’m going to the states straight after for a three or four week tour there, then I’m doing Groovin’ The Moo later in the year, and sometime in between I’m hoping to write more music. I’ve also got some more remixes coming out, but I can’t say too much about that now!